I have a new favourite activity in Paris: picnicking along the riverbank. It’s no particular secret that Paris is great for picnics in general; there are beautiful parks left, right and centre, not to mention the myriad of the other attractive and/or secluded spots scattered across the city. Sunset is definitely the best time of day to embark on a cruise down the Seine. But whilst cruising down the Seine on a riverboat with visiting friends several weeks back, I discovered that The Place to Picnic in this city is, in fact, perched on the banks of the Seine. The cruise itself was lovely – we caught a glorious sunset over the water and darkness had fallen by the return half of the trip, so we could admire the City of Lights in her full, illuminated glory. However, the most remarkable thing I saw was not part of the riverside scenery itself per se, but rather the people populating it. I’m pretty dire at estimating things like space and time, but I would quite confidently say that the people lining the river’s edge went on for at least a good two or three miles – all the way from Bercy to Pont Neuf, perhaps further. Couples and small groups of friends sat sharing food and a bottles of wine, or a few beers, some playing music, all chatting and laughing and clearly having a wonderful time. * Now and again, the picnickers were interspersed with musicians of some description; I think we passed three ‘Big Band’ jazz groups. Needless to say, I decided there and then this river picnicking was something I had to try for myself. So, the next free weekend we had, my other half and I set out to do just that. We walked the two-and-a-half miles or so to our destination**, collecting our picnic along the way: a punnet of raspberries from the greengrocers, a bottle of Sauvignon blanc from the cave, a little pot of salmon-and-goat’s-cheese bites from the little supermarket on the corner. “That’s not a picnic”, I hear you object. That most certainly IS a picnic, by Parisian standards. As long as you have wine and something edible, you have a picnic. It most certainly is NOT lunch, though. And our picnic was intended to be the lunch variety. But we had a plan for that. Just wait and see. Now, although I do enjoy spontaneity, I am a firm believer that, often, planning just makes things better. With this in mind, I rarely have a meal out in Paris without doing at least a cursory Google search first. I’ve gotten it down to a fine art by this point: I’ve cross-referenced lists from three different sources claiming to have found the city’s best vendor of X before my other half has opened Trip Advisor. 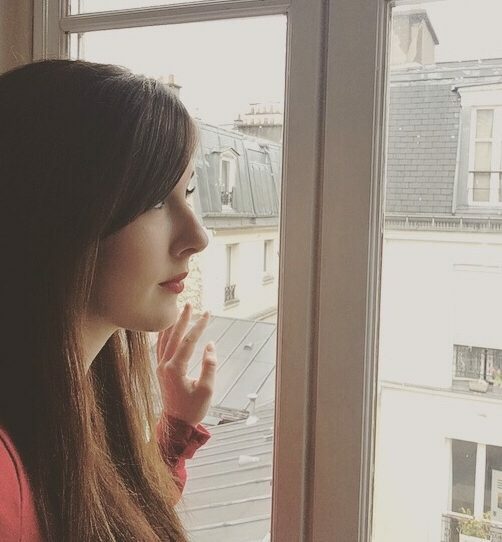 Like I say, spontaneity is a lot of fun, and there’s nothing more satisfying than accidentally stumbling across some hidden gem – but Paris is vast and I’m not prepared to leave the discovery of her finest treasures to chance. My ‘Cosi’ sandwich simply looked & smelled TOO good to delay the first bite with a photograph. Ditto the second bite. in the neighbourhood we were heading to. The verdict? A little sandwich vendor/café in the Latin Quarter, called ‘Cosi’. It’s a fab place; for one thing, not only are the sandwiches hand-crafted to order, but they’re also made on Cosi’s own freshly-baked bread. The bread was possibly the best bit about the sandwich, actually (which is saying something, because the filling was fantastic) – a sort of golden, crispy-yet-soft take on a classic foccacia. Just inside the café door, there was a large blackboard, listing a lovely – and pleasingly creative – selection of fillings listed in both French and English. I stood dithering over this list for a good ten minutes or so, before eventually settling on the “Medwedd”, which featured goat’s cheese, olive tapenade, cucumber and tomatoes. Good grief, it was tasty. Come to think of it, maybe the filling was on par with the bread. The whole thing was bloody good, anyway. It was one of those meals where you just wanted it to keep going forever. Needless to say, I will be going back. Soon. Hmm. I seem to have digressed a little in telling you about my lovely food. Not like me. Anyway, to return to the picnic, we took our sandwiches, along with the other assorted bits and pieces we’d picked up along the way, and found a spot along the riverbank by Pont Neuf, on the narrow, pointy bit of land (technical terminology), right at the end of Île de la Cité. It’s a popular spot amongst locals – the river forks at Île de la Cité, so you’re pretty much sat in the middle of the Seine, which makes for very scenic picnicking. You can even choose whether you want to sit in sun or shade, depending on which side you decide to occupy. We set up in the sunshine, spreading out the picnic treats before pouring a couple of glasses of wine – and voila, just like that, we merged into the picture-perfect Parisian scenery. One of my most ‘Parisienne’-feeling ensembles, for the occasion. Not that the opinions of onlookers matter in the slightest, but… all things taken together, I’ve rarely felt quite so Parisienne. It was a pretty pleasant feeling. * Alright, I’m sure not every single one of the hundreds of people we passed was having a wonderful time, but do you have to be so pedantic? *** I don’t know why the raspberries seemed particularly remarkable – I mean we had wine, and actual glasses – but it was this last comment which confirmed to me that it was indeed our setup they were referring to. Hi! The Seine and Paris look so nice! Btw, I like your approach to picnics. Professional and passionate at the same time, that’s how champions do it! I should never read your blog when I’m hungry! I’m almost always hungry by the time I finish writing, if I wasn’t at the start! It sounds like you’re fitting in with the locals very well. What a treat!